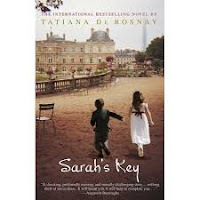 I recently finished the book, Sarah's Key by Tatiana de Rosnay. I don't usually do book reviews or recommendations, but this book was begging for one. The story is so sweet and unusual, and the characters are so vivid that I couldn't help myself. Sarah's Key consists of the stories of two characters. It moves between the narration of both characters until eventually one of the stories ends, and blends into the other. I found this quite unique. Although there are many writers who allow more than one character to be first person in a book, not a lot of them switch between milieus. Tatiana de Rosnay switches between the story of a young Jew in occupied France and an American Journalist in modern day Paris. Although the Jew was born much before the American, the story allows them to share a bond. One of the things I love most about the book is that Tatiana ridicules those who believe that ignorance is bliss. She does it so subtly, that I didn't give it a second thought until I finished the book. However, I realize now that she does indeed discuss how sad it is that people will believe that their pasts have nothing to do with their futures, just so that they can continue with the present. The characters in the book are all flawed, each one of them, but that is what makes them all the more realistic. Tatiana has written excellently, and you realize the changes in character not by the font, or the chapter, but simply by the style. However, as the young girl's story gets more complicated, she starts sounding almost like an adult. This unnerved me, but made me realize that for those children, surviving meant growing up. The story starts with a young girl terrified of the soldiers knocking at the door. When they insist on searching the house, she locks up her brother in the hiding place in their cupboard, believing that he will be safe there. She leaves the key for her father to find. She soon realizes that when the Nazis take her away, she will not come back. What disturbs her is that the soldiers mistreating her aren't Nazis-they're French policemen. It changes soon to the story of an American journalist named Julia Jarmond. She is modern and very different from the Parisians around her. As her work leads her to inquire about occupied France, she touches a nerve with her in-laws and their family. However, she continues, and soon unravels the story of a girl called Sarah Starzinki. I'd recommend this book to all those who'd like to be swept into the past without forgetting about the present. To all those who know, that our future can become our present. But our past, will remain our past. I hope you try and enjoy this book. While reading it, don't forget to look for the small details that indicate de Rosnay is satirizing our world.